KIEV, Aug. 24 (Xinhua) -- Ukraine marked Independence Day on Friday with a parade of servicemen and military hardware in central Kiev. A total of 4,500 service personnel from the Ukrainian armed forces, the National Guard, the State Border Service, the State Security Service and other defense and security agencies participated in the parade. For the first time in Ukrainian history, the parade involved 120 female soldiers, unlike last year's male-only event. The parade ended with a spectacular airshow consisting of 30 aircraft, including the newly-designed Ukraine-produced transport aircraft An-178. 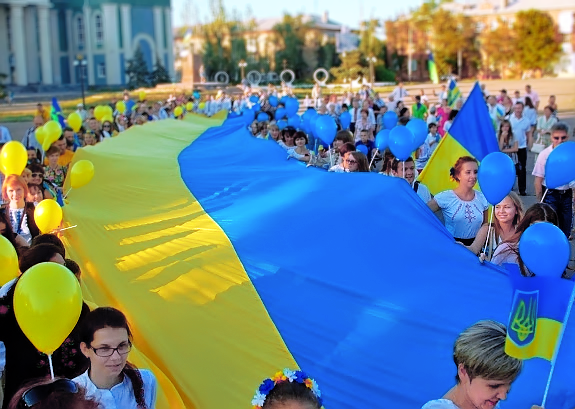 The celebration attracted thousands, many decked in traditional embroidered clothing while holding Ukrainian flags. Delegations from 18 foreign countries, including U.S. National Security Adviser John Bolton as well as other members of the North Atlantic Treaty Organization (NATO), attended the parade. While addressing the parade, Ukrainian President Petro Poroshenko said that he will soon submit to the parliament the draft amendments to the Constitution on Ukraine's goals of the membership in the European Union (EU) and the NATO. "I will insist on enshrining in the Constitution our aspiration to join the EU and to join the NATO," Poroshenko said. Ukraine obtained independence from the Soviet Union on Aug. 24, 1991, which is celebrated as the country's Independence Day.